In the UK, the time limit on contesting a will can in some circumstances be as little as six months after the date of the grant of probate . Given this it is imperative that you seek advice as quickly as possible. A claim for financial provision from an estate under the Inheritance (Provision for Family and Dependants) Act 1975 is governed by that Act which sets down the claim must be brought within 6 months of the date of the Grant of Probate. The reason for this is that the government do not want the administration of an estate unnecessarily delayed by these claims. NOTE: when we say these claims must be brought within 6 months of the date of the Grant of Probate, what we mean is that they must be issued with the Court. There can in fact be a further delay of 4 months before these claims have to be served following issue of Court proceedings and the claim is not activated until it is served. There are some circumstances where a claim under the Inheritance (Provision for Family and Dependants) Act 1975 can be brought beyond the six month time limit, but in general they will require an application to the Court to be made and given the Court will have discretion (it is not obliged to allow the claim to proceed in a given circumstance), such an application is by it nature risky. In general it will be necessary to show that your claim under the Inheritance Act has considerable merit, there was good reason for bringing the claim out of time and no prejudice to the existing beneficiaries (such as might occur if a substantial part of the estate has already been distributed). A claim against the validity of a Will has NO TIME LIMIT AT ALL. It can brought at any time after the death or Grant of Probate. The reason is this. What is being argued is that the Will did not exist (legally). Therefore there is no necessary time limit. How can there be if the Will did not exist in the first place? However, whilst this might mean a claim can be brought years after the death or Grant of Probate. There is a de facto time limit. After a number of years have passed the evidence that you will need to pursue your claim is likely to have dissipated or been lost or destroyed. Quite simply, the important witnesses will have forgotten what happened or papers which are critical to your claim (for instance medical records) will have been shredded. It is critical then that advice is obtained as soon possible and the claim is pursued at the earliest opportunity. We recognise that it is easy to confuse a claim against the validity of a Will with a claim for financial provision under the Inheritance (Provision for Family and Dependants) Act 1975. A claim under the Inheritance Act is a claim against the estate for financial provision – you are not disputing the validity of the Will (but accepting it – which is partly why court proceedings can only be issued after the Grant of Probate which is the official seal of approval confirming the Will is in order). However a claim against the validity of a Will is a claim that there is something wrong with the Will; for instance that when it was prepared the testator lacked sufficient mental capacity to make a Will (as he could not have understood who his near relatives were or the size and nature of his estate) or it was not properly executed (witnessed by two witnesses in accordance with section 9 of the Wills Act 1837). The time limit for these claims is much more clearly defined by the Limitation Act 1980. In general a claim for breach of trust must be brought within 6 years of the breach complained of but again in reality they must be brought as soon as the breach is identified to ensure you can pursue the claim. Some types of breach that amount to a fraud may not have a time limit at all. However, what must be borne in mind is that all these claims rely on good evidence for their success and that evidence must be collected at the earliest opportunity otherwise it can be dissipated, forgotten, lost or destroyed. A claim for a share of the estate (where there is an existing entitlement under the Will) must be brought within 12 years of the Grant of Probate. The complexity of the Limitation Act of 1980 can often mean that quick action over inaction is imperative. 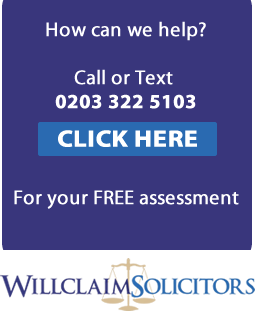 We invite you to call us on 0203 322 5103 to start the will claim process.